Back in London after our holiday in Lanzarote and we have managed to keep ourselves busy with one thing or another. 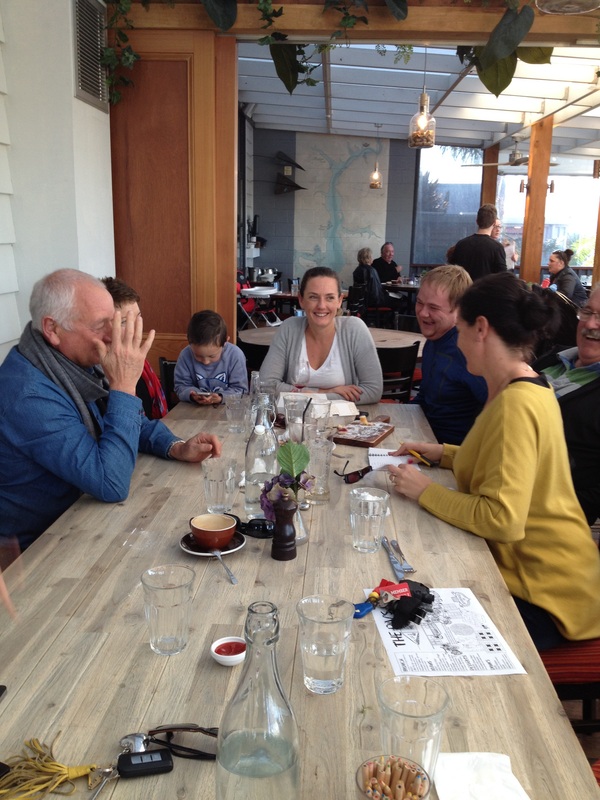 Roy and Ian had a couple of boys days out, which Roy will write up in a blog post……..soon he tells me! Meanwhile Alex and I did what girls do, go to netball and go out for lunch with some of Alex’s girlfriends, both events which I neglected to take a single picture! Oh well, you will have to take my word for it that it was a couple of great days. 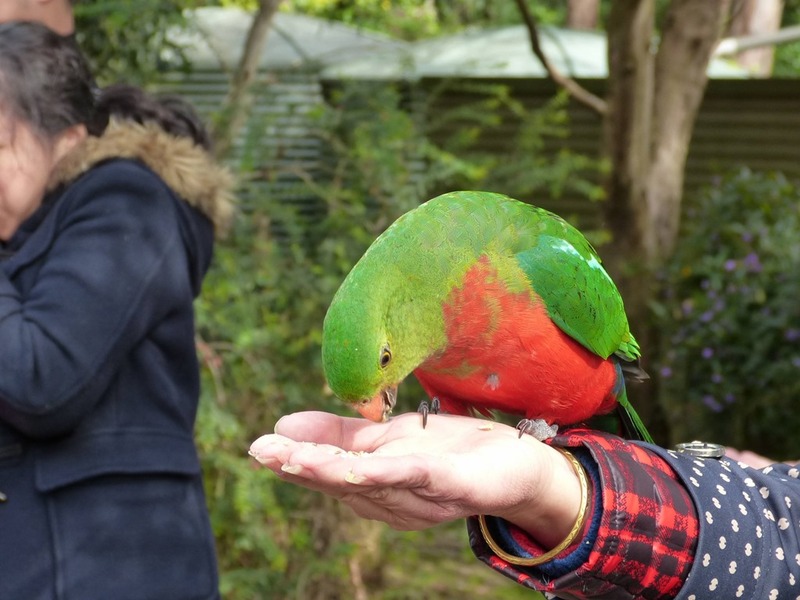 However we did all go out together for the day on Sunday to Eagle Heights, a wildlife and bird sanctuary that has flying demonstrations with some of the birds. We were not sure what to expect but I have to admit we were very surprised as we did not expect to be able to get up so close and personal with the birds. First up we had a talk and information from the guide about the birds we were about to see and of course some Health & Safety instructions….like put away all food as we were about to have demonstrations from birds of prey, and they like nothing better than a free meal. First out was an American Bald Eagle. What we did not expect was to have the bird fly over us repeatedly at very low levels, as in my hair got ruffled a few times as it flew overhead as it’s wings beat down overhead, it took all my resolve not to duck suddenly so as not to distract the bird. It was very impressive with the eagle flying from the handler in front of us to another handler who moved along the back of the crowd so that the bird flew over as many of us as possible. A truly amazing bird, and a lot bigger than I expected. It too swooped overhead flying from one trainer at the front to the one behind us. 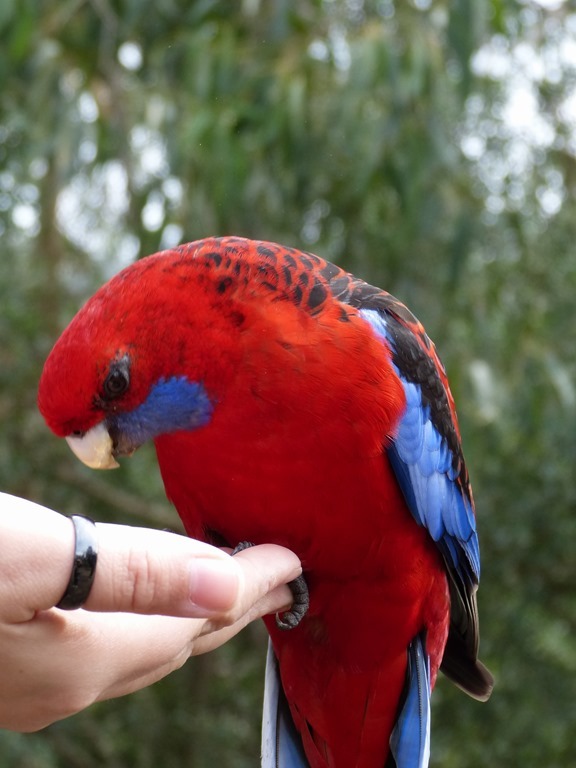 All throughout the demonstrations we were told all about the birds and their idiosyncrasies, and tales of interesting and funny incidents that have occurred over the years. Next came a Caracara which hopped along the ground, running in and out amongst our legs and hopping onto seats. Native to the Falkland Islands it’s a very clever bird that has been known to put its memory and knowledge to good use. 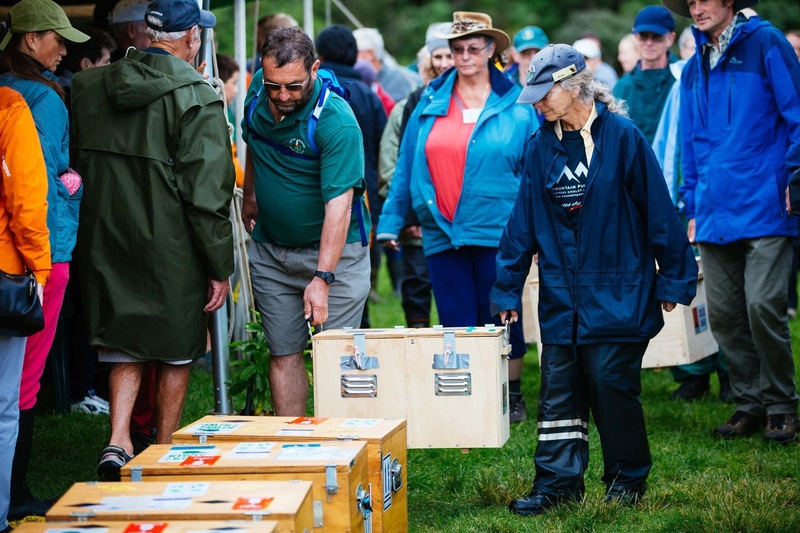 We were told that during the Falklands War the birds watched land mines being laid and knew exactly where they were. Over the years that knowledge was handed down through the generations of birds and put it to good use by luring seals to where a land mine lay buried so that once the seal triggered the mine, the birds got an easy takeaway meal!!! After he was safely put back in his enclosure the Peregrine Falcon was brought out. It put on an impressive display climbing high, almost stalling before turning to swoop down at impressive speeds to try and catch the lure being swung by the handler. Apparently these birds have been clocked at over 230mph (that’s over 300kph) whilst pulling 26G Force. 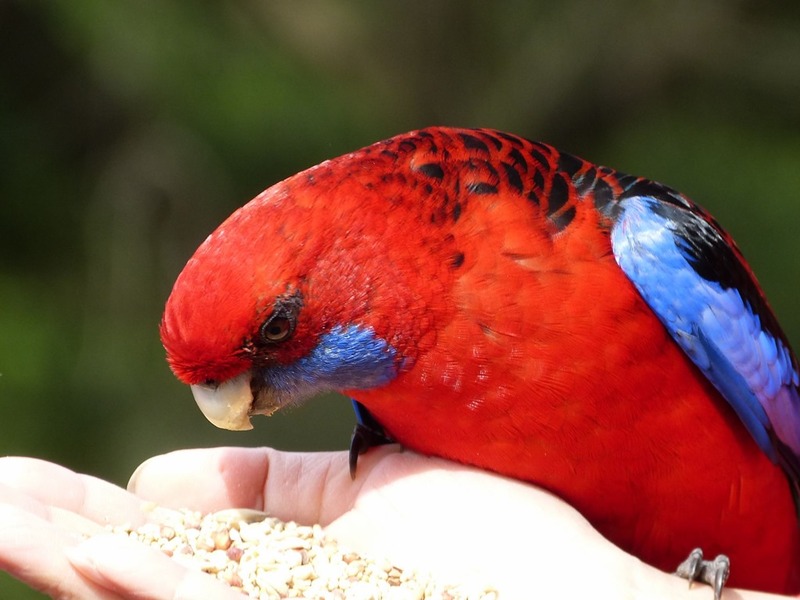 Did you know that fighter pilots pull up to 13G max so these birds are really amazing. And yes, they are the fastest member of the animal Kingdom. and it was almost impossible to take a picture of the birds in flight as they move so swiftly, in fact the handler challenged those with the big cameras to try and capture a good shot of it diving down and past the lure. So my picture taken with my phone is not too bad as I managed to actually capture an image of it flying by! After the flying demonstrations we wandered off to see the rest of the birds and as well they had an opportunity for us to hold and pose with either a wee baby owl (which children queued up to hold) or an American Bald Eagle. Bald eagle and balding Roy – he had just had a haircut!!! Alex chatting to the bird. 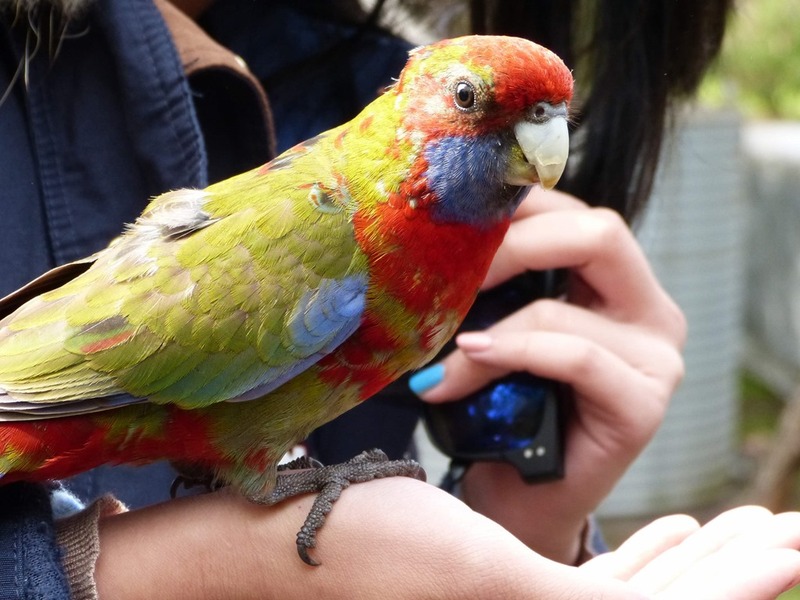 We spent a bit of time looking around the facility and the numerous other birds that they have including; maribou, rhea and kookaburra, they also have many other different types of eagles, hawks, falcons, vultures and owls, as well as huskies, meerkats and some reptiles. By the time we had finished admiring all the animals it was getting on for mid afternoon so a late lunch/early dinner was in order at a local country pub. that’s us enjoying a great pub lunch, washed down with appropriate beverages of course before we headed back home to relax for the evening. A great day out with many thanks to Ian and Alex for organising yet another lovely day. It’s fair to say that being in a Sanctuary means that we are surrounded by lots of wildlife in one form or another. 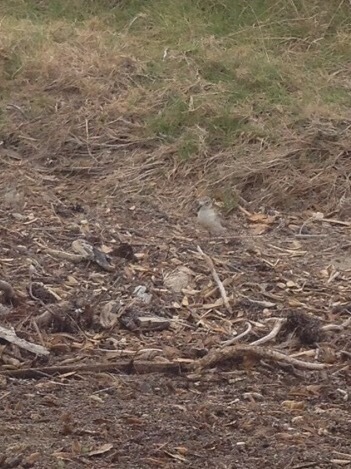 Currently there are 4 pairs of Dotterels nesting on the beach, they build their nests right on the high tide mark which necessitates the nests having to be sandbagged to protect them from extra high tides and also to be roped off from humans who may decide to have an extra close look. Dotterel are a threatened/nationally vulnerable species, here at Shakespear there have been 16 chicks hatched, of which 5 have been lost and 6 have fledged. 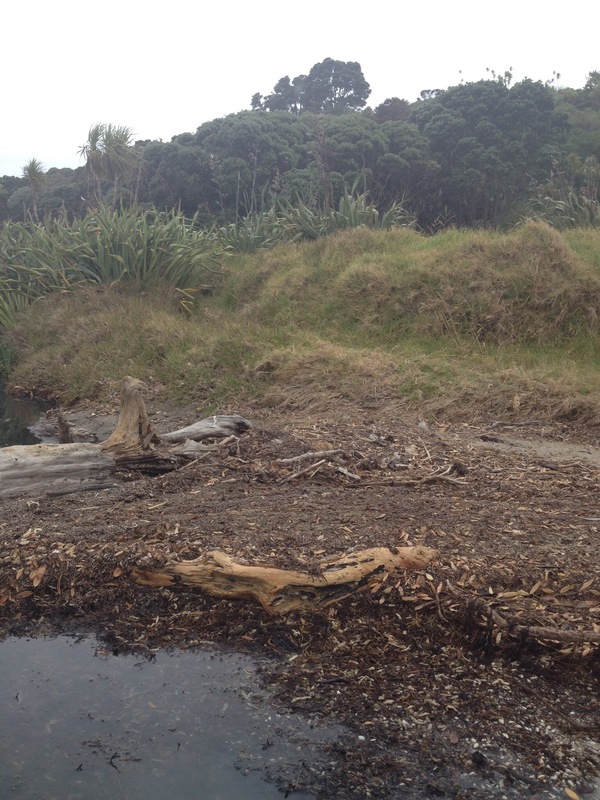 Some eggs were lost due to high tides, hooligans and other creatures so protection of their space is important. The other day we had to move one lot of fencing which was protecting their patch as the dotterels had, in their wisdom, moved further along the beach. 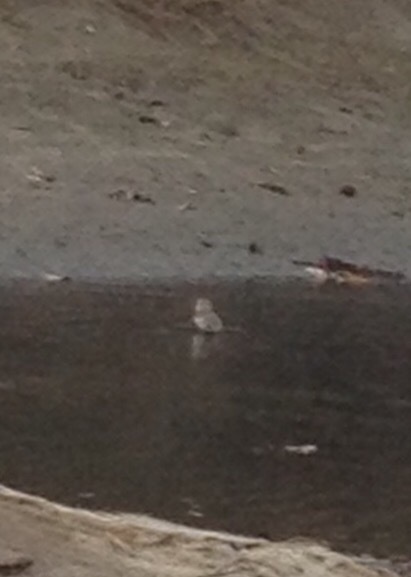 Can you spot the well camouflaged adults? 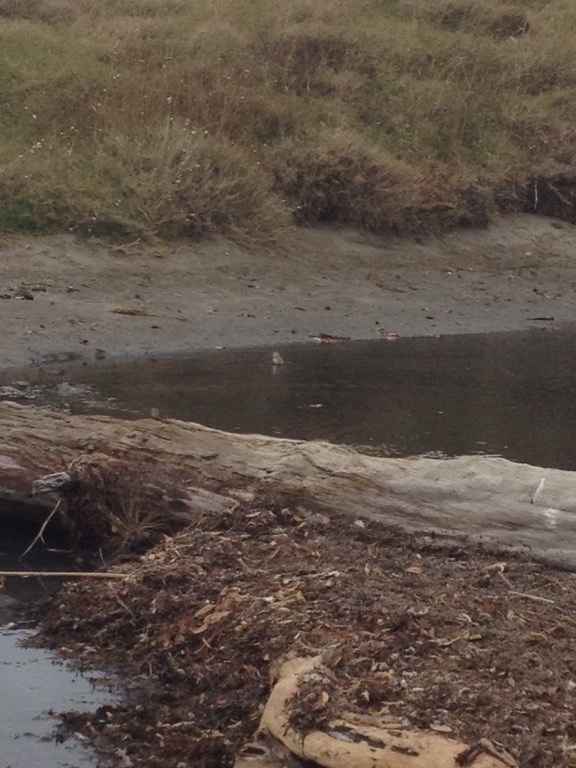 But first the had to get their chicks across the small creek…who knew that they could swim? After we had set up the fencing, put up the signs, and made sure they were safe, the adult birds with chicks in tow, then proceeded to head back to their previous haunt further along the beach. Since then they have moved between the two areas daily I guess trying to decide which one is best? 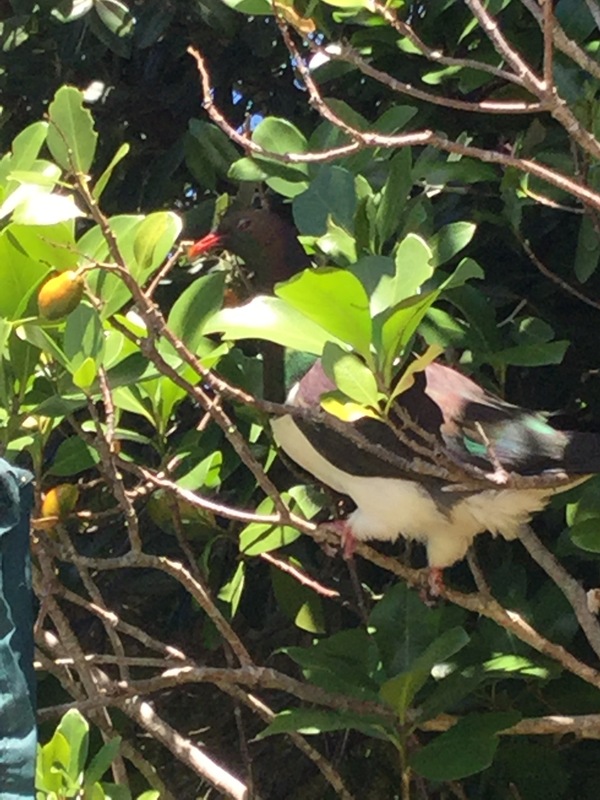 The Kereru, NZ wood pigeon, are feasting on the ripe Karaka berries on the tree in front of our van, gorging themselves until they are almost too heavy to fly before taking off with the unmistakable sound of their wing beats to gain enough height and momentum to get back to their home. They also seem to enjoy the new growth on the kowhai tree growing at the rear of our van but they have not been left in peace to eat the leaves as we have seen Tui chasing and dive bombing the much larger Kereru until the pigeons fly off out of their way. 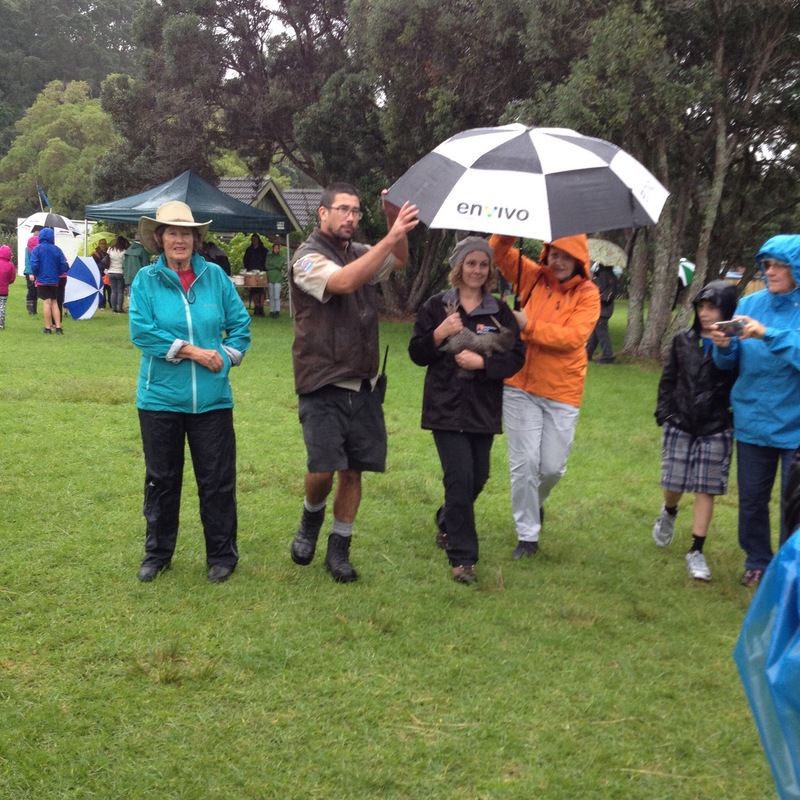 We have also seen Tui exhibiting similar behaviour toward a magpie, chasing it in a menacing manner, diving and swooping on the magpie until it’s forced from its flight to land, and then continually harassing it until it finally leaves the area. 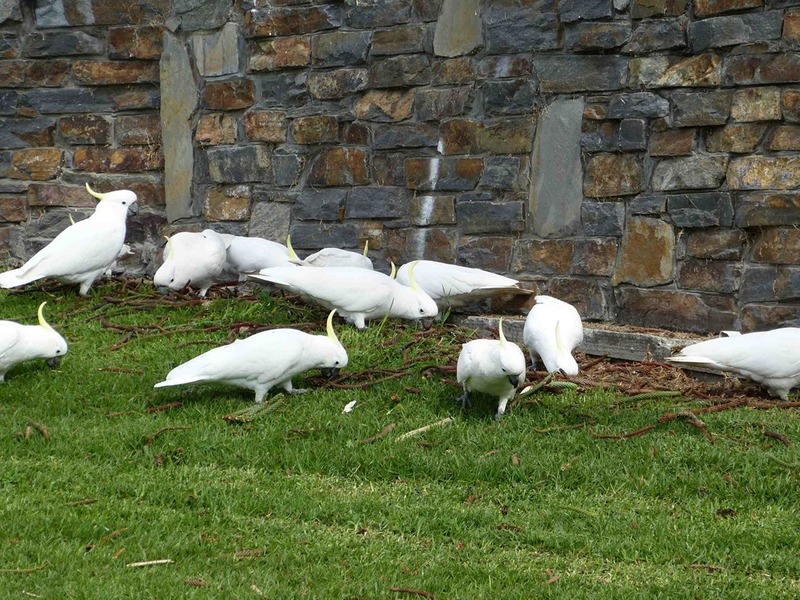 In the past two years two species of birds have been reintroduced to the Sanctuary, the Whitehead – which I wrote about its release into the park here, and Robins which were reintroduced last year and you can read a little about them here. 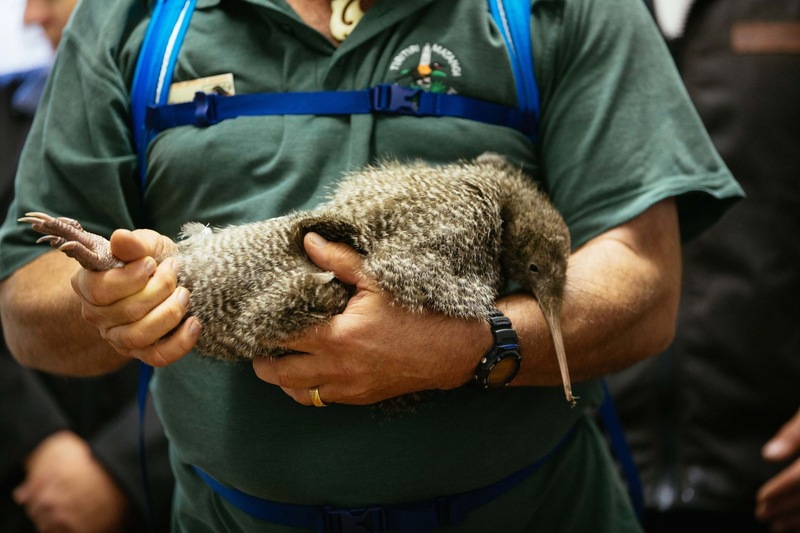 This year in the autumn Kiwi are being reintroduced into the Santuary which is fantastic news for all, but in particular, reward for all the hard work done by the rangers, staff and the numerous volunteers who put in hours of work throughout the year. It’s not all bird life here though. 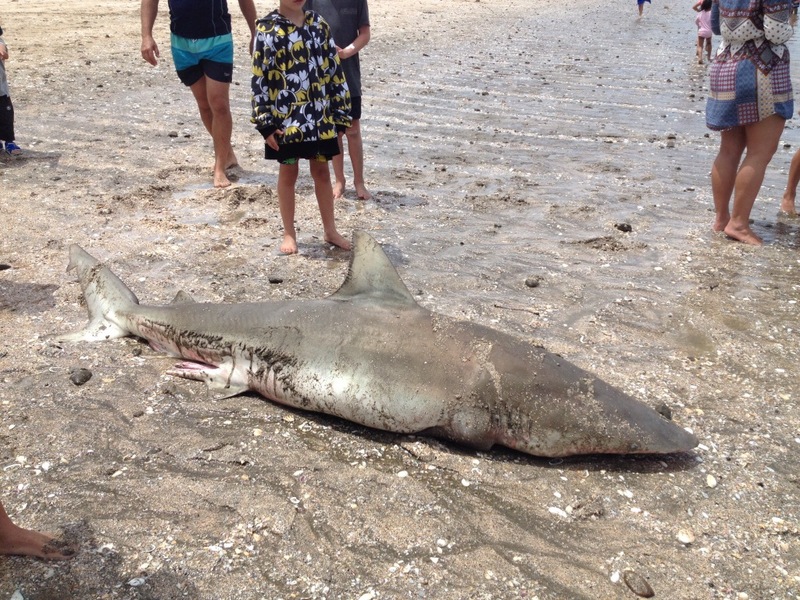 This fellow was dragged onto the beach after being found dead in the shallows by some undoubtably surprised swimmer. It’s ﻿a bronze whaler shark, about 2m in length. It was later recovered by DoC and taken away for reasearch purposes. It’s not something I would personally like to find whilst I am swimming!! 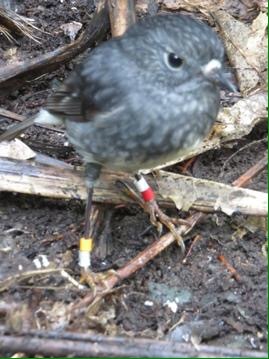 One of the translocated Robins with his personal identity leg bands. The Robins have successfully bred this last spring, with many chicks having been successfully raised and fledged. 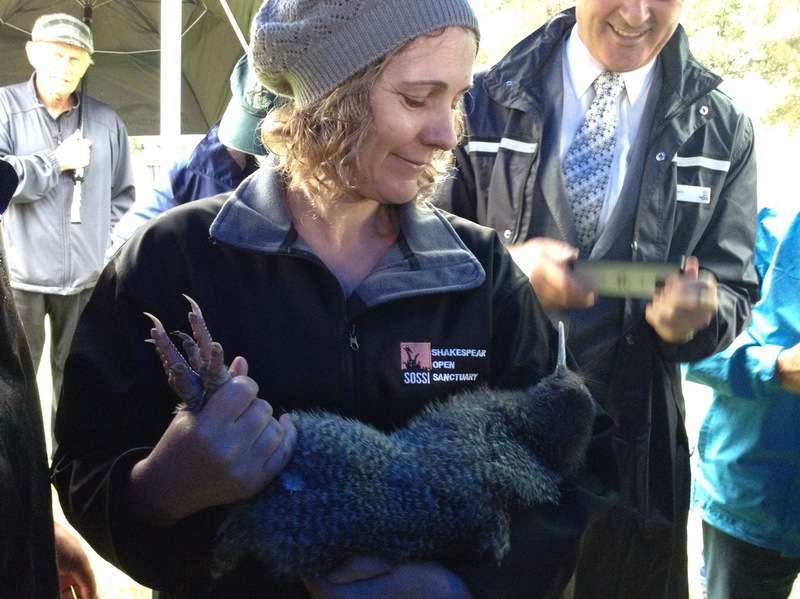 Let’s hope the same occurs with the Kiwi translocation. Back to the money raising exercise. Some people seem to be glued to their devices all day, every day, with some of the younger generation coming two or three times a day to charge up their phones. And with most people using their phones as their camera to record their holiday pics, we get a good number of customers each day. What usually occurs is that people come, plug in their phones and then they leave, to return an hour or so later when the phones have charged. This morning though we had a different sight, a young man came to plug in his phone, sat in Roy’s chair for a moment, next minute he was fast asleep!! Seems he has a young family and wasn’t getting much sleep, so he caught a few winks in the relative quiet outside our van! I know, I know, still catching up on Melbourne blogs before we get back to some semblance of a “normal” routine. So just a quick update of some of the wildlife encountered on our recent trip. 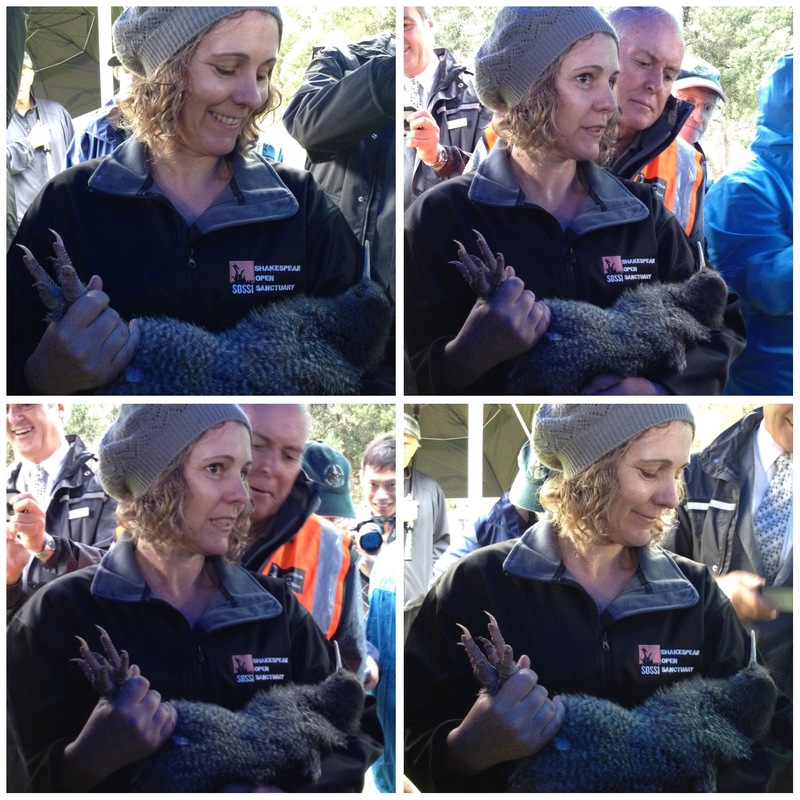 First there was the Koalas nonchalantly sitting up a tree…and no, they weren’t K..I..S..S..I..N..G as the old school ground taunt goes. 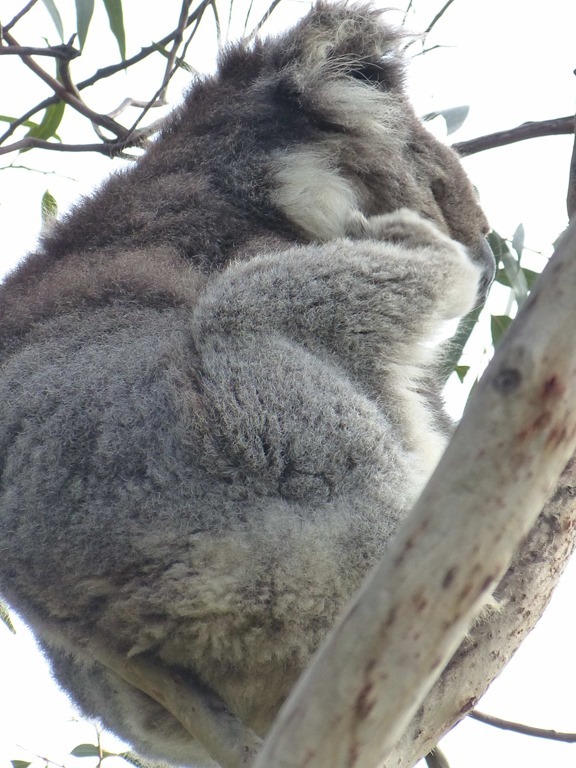 These Koalas were in some trees in a layby just off the road on our way to they Great Ocean Road, most of them were sleeping but I did manage to capture this one having a scratch. These colourful natives were all found in laybys on the side of the main road and fed out of our hand with the food that our guide supplied. 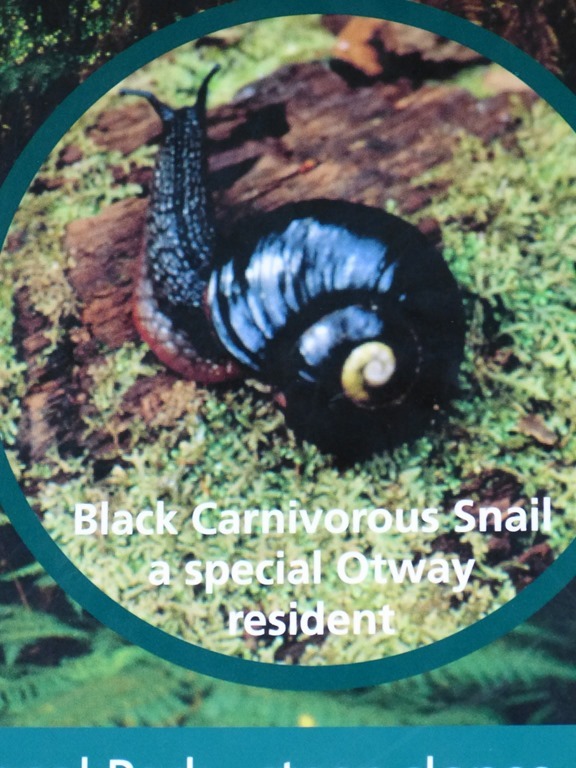 On our walk into the Otway forest, we came across another native, this time a snail, completely black and also carnivorous This is a picture off the information board, however we did find one along our walk but I forgot to photograph it. Yes, I have been having issues in posting a blog but I am assured that it is an issue with the App, and not an issue with me!!! 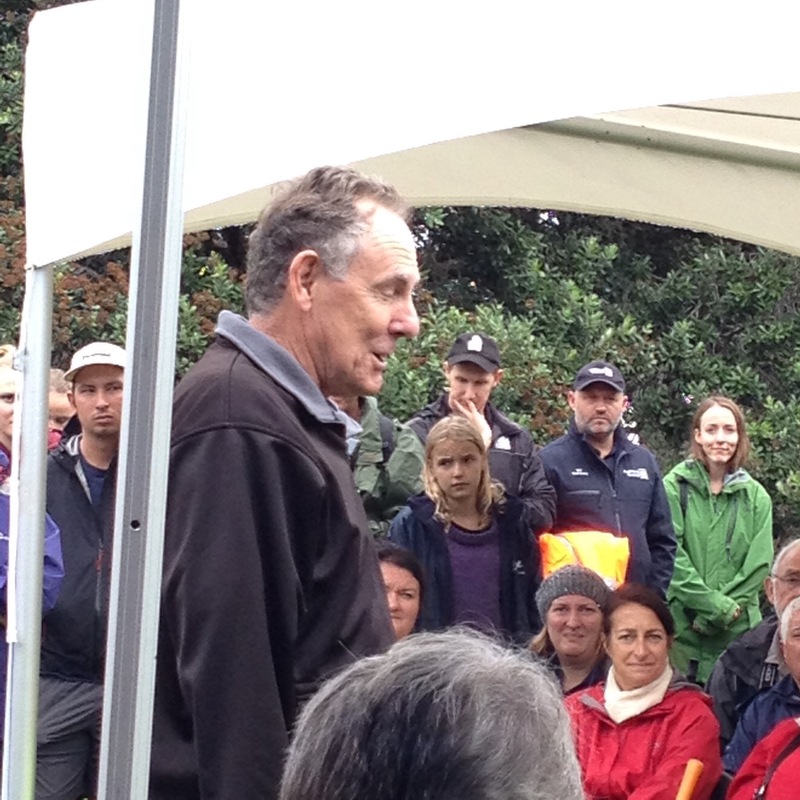 first of all a few pics that should have been included in previous posts….. 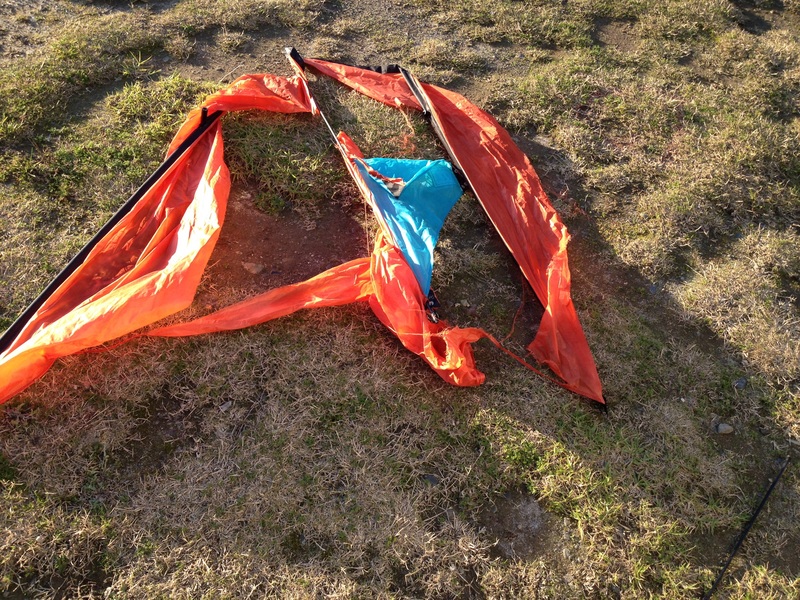 This is what a wrecked kite looks like!!! Ardmore was our next stop for a few nights whilst we got shopping done, caught up with chores and generally got ourselves sorted. Mind you the first couple of days were utter disasters as everything we attempted to buy or find was proving to be very elusive which meant we spent an awful lot of time running around the city but not achieving much. But then after a couple of days things started to click into place and we got ourselves sorted. We (Roy & I and Pat & Sue) also spent a bit of time at Antony’s, not only utilising his washing machine but also cooking and sharing dinner at his place. 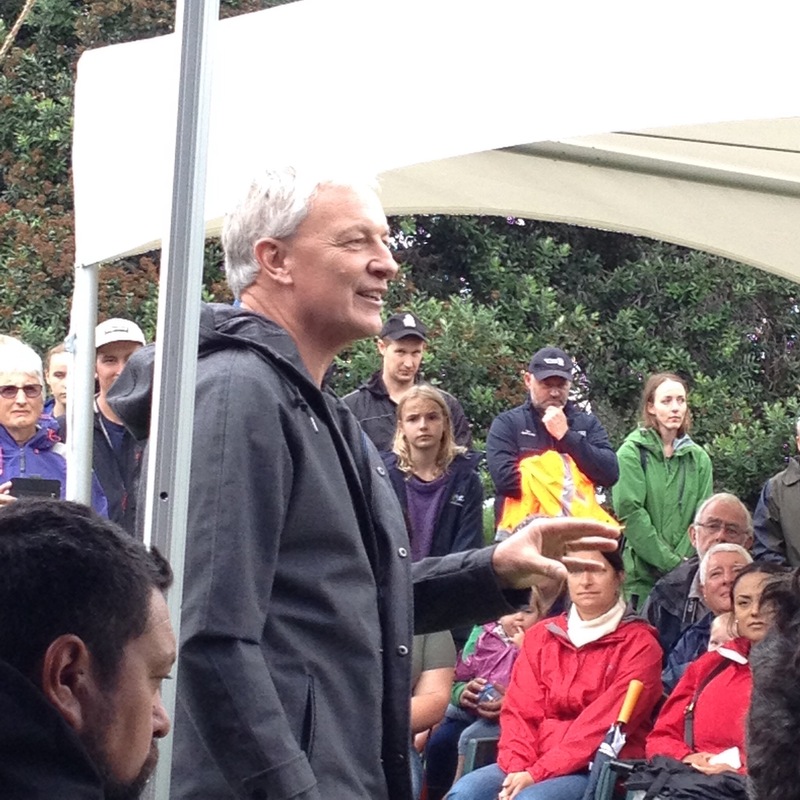 We were made very welcome and very cosy nicely tucked up in his house with the fire going keeping us all very warm as Auckland put on a show of chilly weather and good frosts – thanks Ants. After we got all our tasks completed, we could not wait to get on the road and off over the bridge. I seem to hold my breath as soon as we hit the motorway until we are well on the north side of the harbour bridge then I start to relax the further north we get. 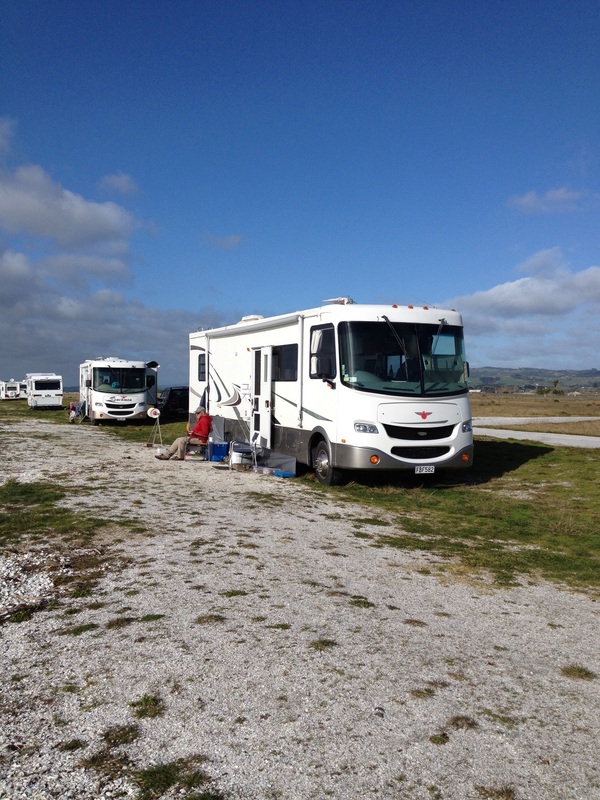 We headed back to Shakepear Camp Ground, we arrived to find our friends Brian & Marj already here and it was lovely to see them again. After catching up with all their news, we settled in for the evening. 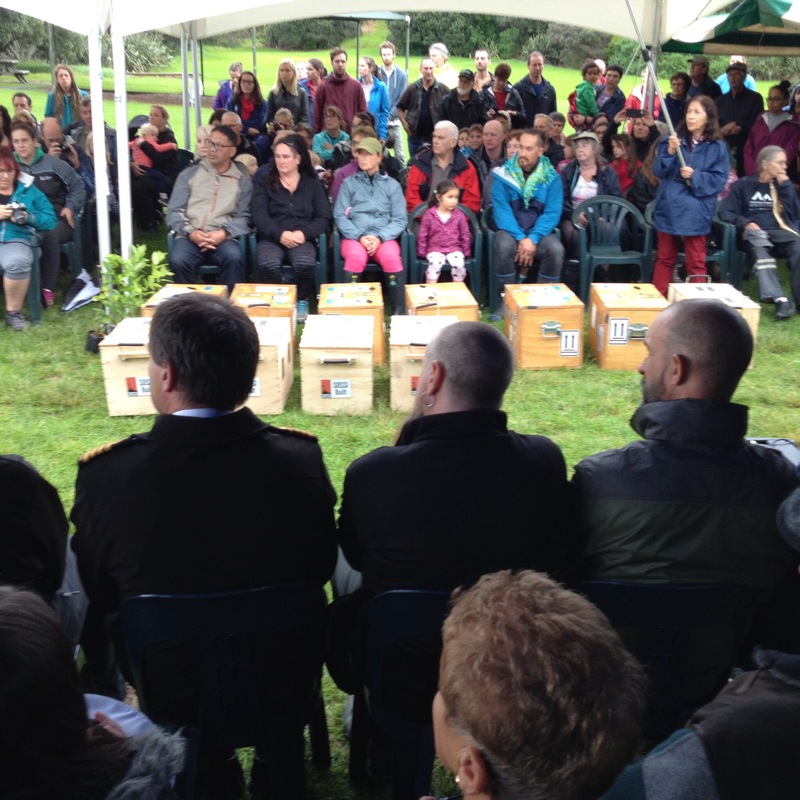 We were very privileged to be invited to watch the release of the birds. 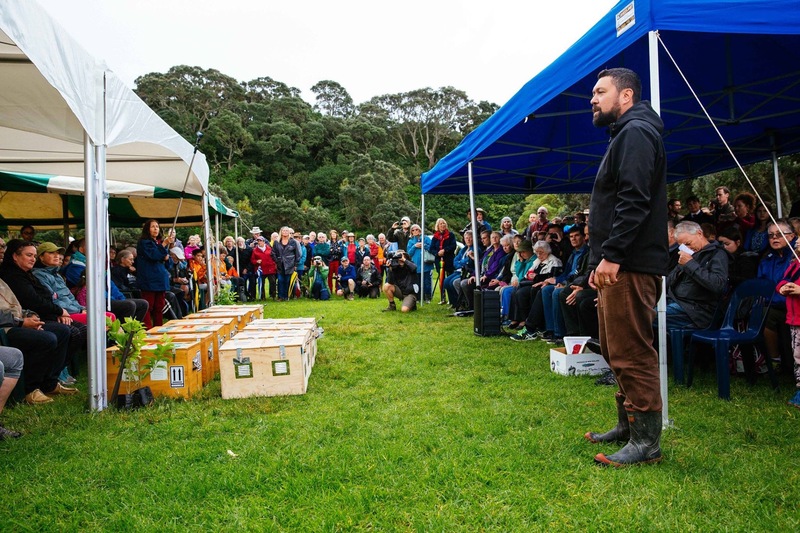 The birds had been brought over from Tiritiri Matangi Island that morning and after an official welcome the 40 birds were released into the bush, they made a vociferous entrance into the park. After the ceremony we had been invited to Steve & Leslie’s for dinner and to stay the night so we were off to Torbay for the evening, and a very pleasant evening was spent. They had their grandson, our great nephew, Ben staying the night and so after dinner we played Snakes and Ladders (been a few years since we’ve played that!!!) 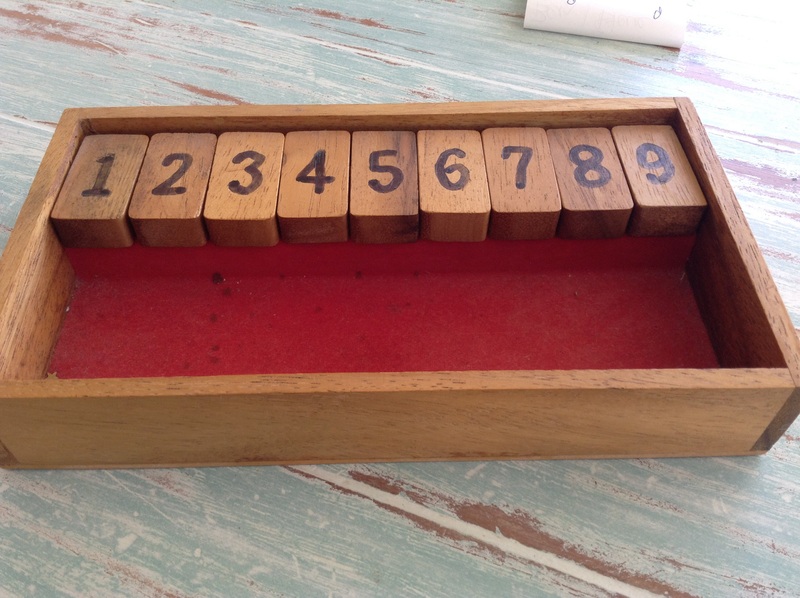 then a new game for us which consists of wooden numbers 1 to 9, and a pair of die. The object of the game is to throw the die, and whatever number you throw, you flip over numbers of any sequence that add up to the same total of the dice eg. The dice throw is a 5 and 4, which add up to 9 so you then choose to flip over just the 9 counter, or 8+1, or 7+2, etc etc with the object of the game is to flip over all the counters. So if toward the end you just have a couple of numbers left, then depending on the dice throw if you cannot move then you add up the total of the counters left unflipped and that is your score, then your opponent has their turn, continuing on until the first to reach an agreed total and the lowest total score is declared the winner. A great game especially for kids to learn good number skills. Sunday morning and Roy and I had a few errands to run, then we were meeting Steve & Leslie at the Riverhead Tavern for lunch along with their three daughter and grandchildren attending, oh and Ants and us as well. We had a lovely long lunch before we all set off for our respective homes, it was great to catch up with everyone, and the meal was very good too. It’s definitely not as cold here at Shakespear as it is over the other side of the city but it has been wet and windy. In between wet days we have managed to get a few more chores done, like making a new trace board for the kite fishing and other bits and pieces ticked off the never ending list. One day we headed back across the city to Antony’s to help him stack away a load of firewood as well as take the opportunity to pick up our mail. Have I mentioned the mail issue previously? Well, living on the road does come with a few issues, like where do we get mail sent?……we have tried to get most things transferred over to email, but some things have to have an address so rather than using friends and family’s addresses we now have a PO Box in Manukau which is not far from where Antony works so he can check it occasionally for us when we are not around. But let’s not get into the issue of requiring a physical address (and not a Post Office Box number) by some – the electoral roll is one – as that is a whole other blog post all of its own!! Tomorrow, Wednesday, we are off again heading northwards. We shall keep you posted. 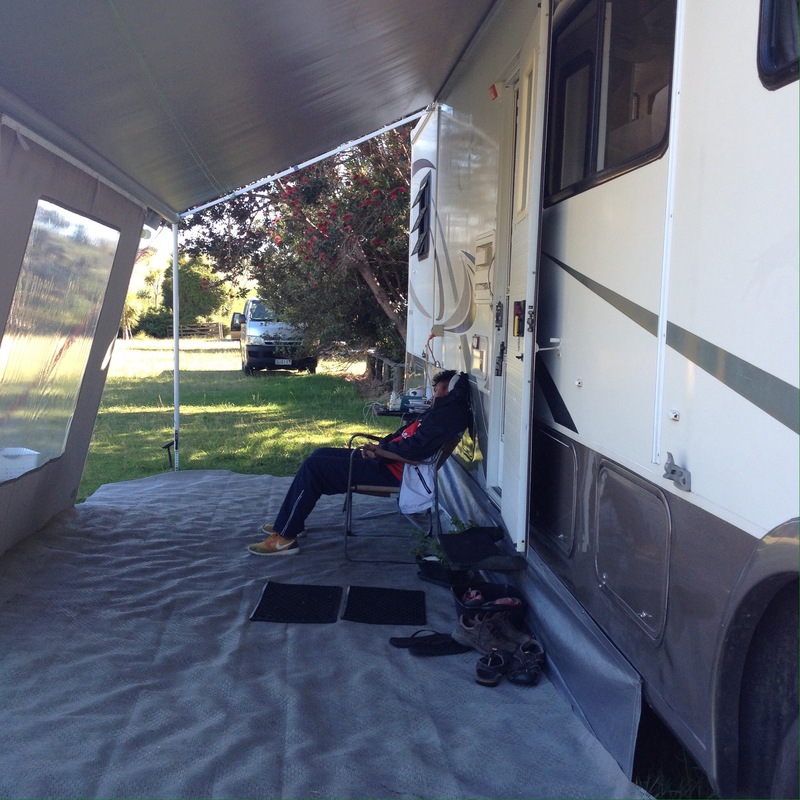 Another week has slipped by in our role as Camp Hosts or Camp Narks as Antony so eloquently called us! 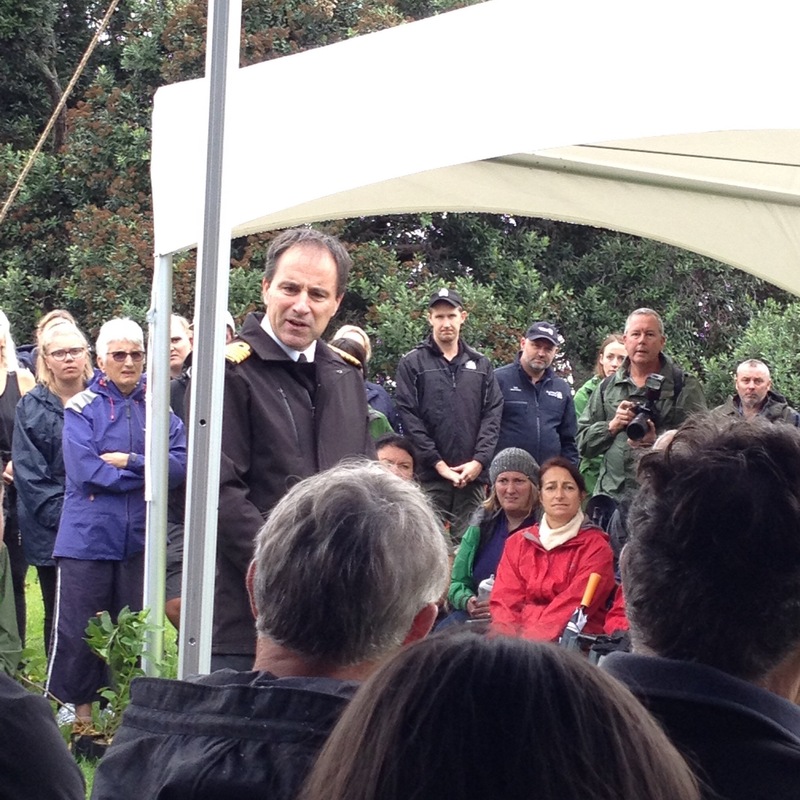 And before you ask – no, we have not ‘narked’ on anyone –yet! 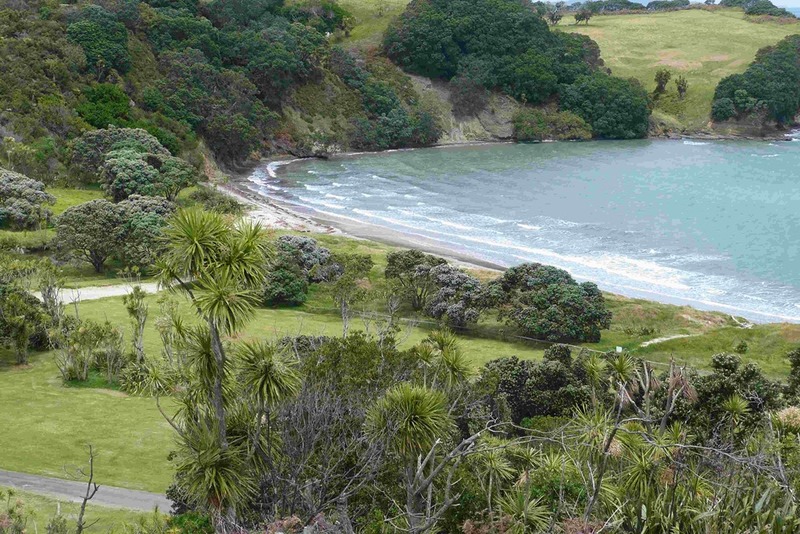 A walk to the top of the hill overlooking the camp and beach is where the following sets of photos were taken from. 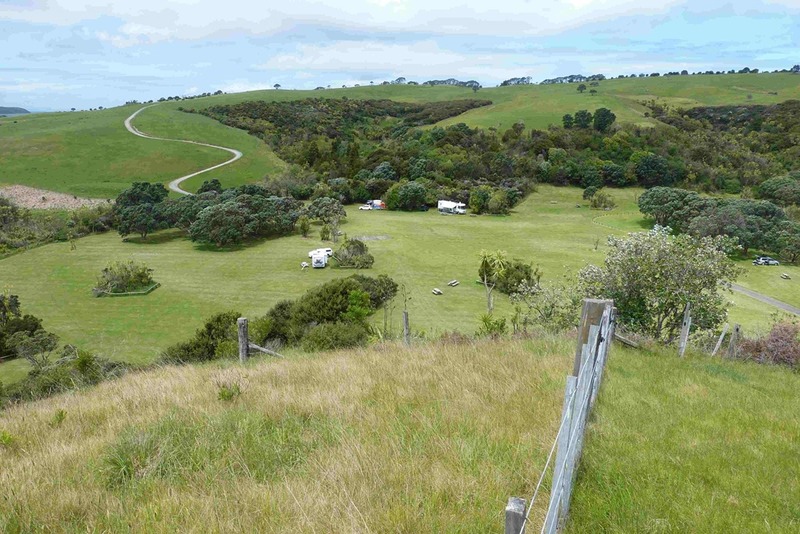 Looking down onto the camp with us parked there in the middle toward the back, and the photo on the right is zoomed in on the track up over the other hill. Zoomed in on us parked up….and closer zoom. 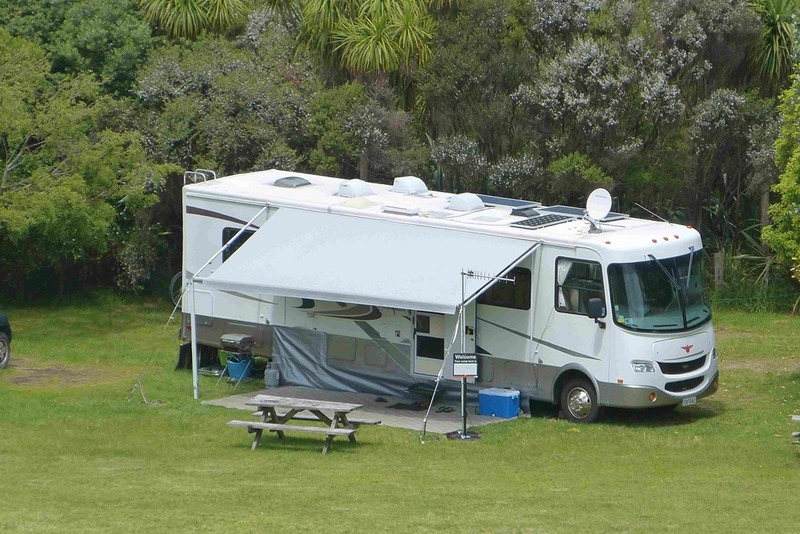 Yes, we know the awning is not level, that is done purposely to facilitate water runoff. 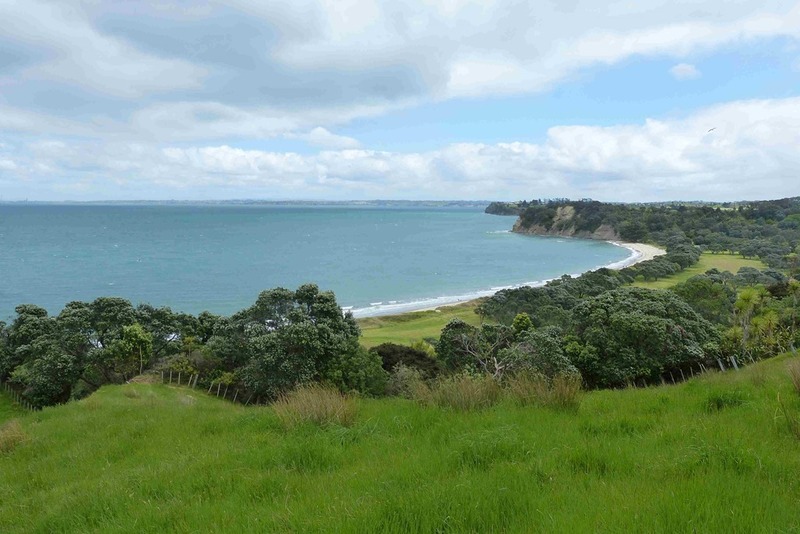 A Panoramic view of the Te Haruhi Bay the campground is at the left end of bay below the ridge. 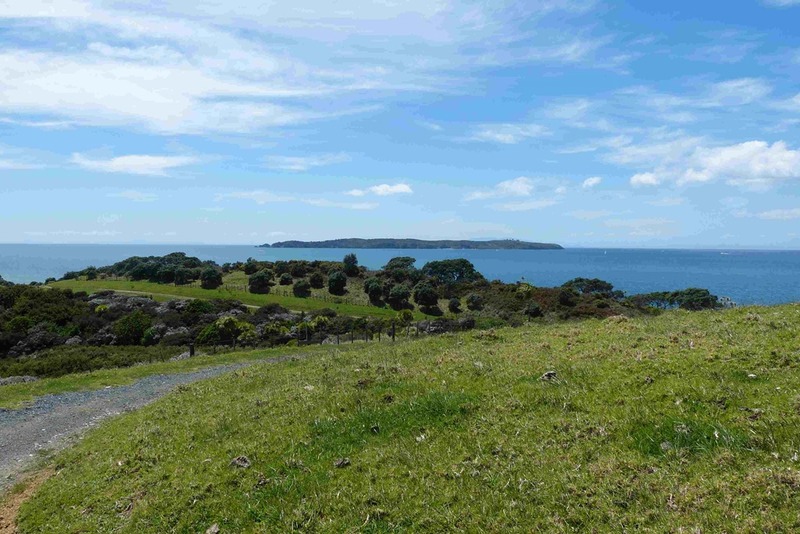 Looking out to Tiritiri Matangi island from the top of the hill behind the camp, and a view of Pink Bay. 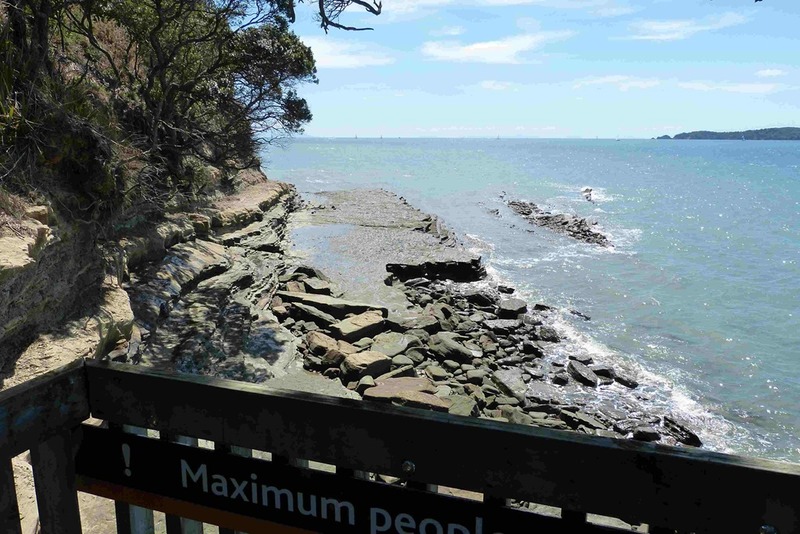 No sand but a papa rock shelf from which people fish. This same shelf stretches from the bay in front of the camp around to Army Bay and can be walked all the way at low tide. We have watched a number of people wandering past our van to walk up over the hill with sacks thrown over their shoulders, returning some hours later with sacks bulging with their contents. One day we got chatting to one chap who showed us his catch of Kina and who offered us a couple to try. 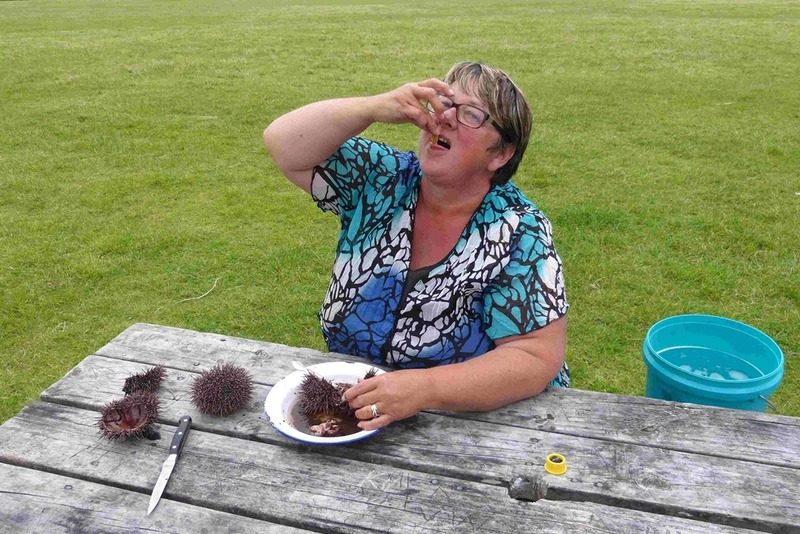 Kina is the Maori name for sea urchin or sea egg, which is endemic to New Zealand waters. 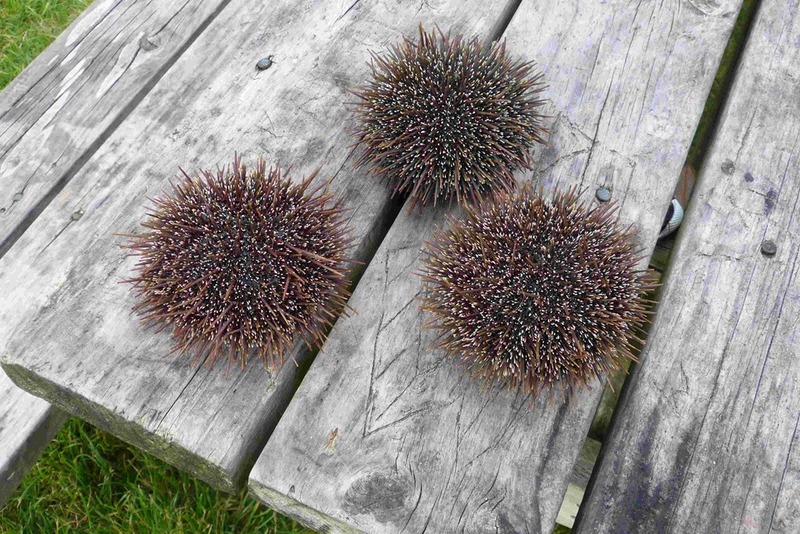 They are a prized delicacy to Maori, with the roe the edible part of the urchin. 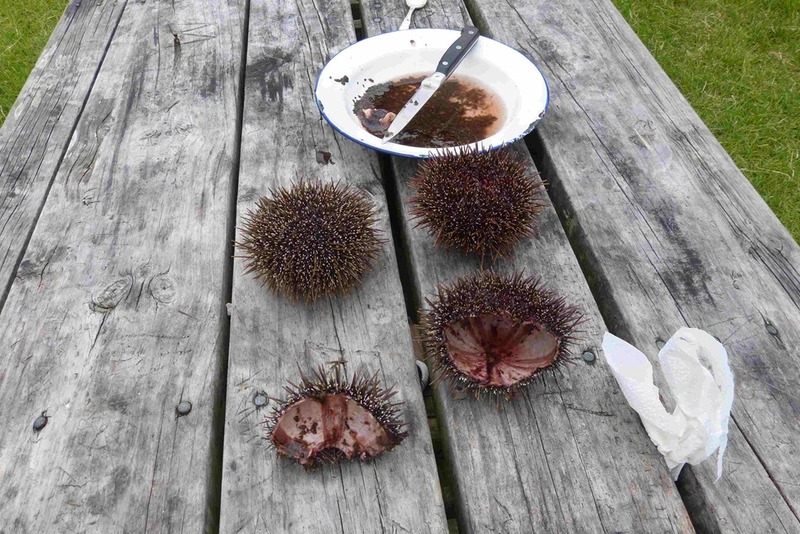 They are spiny wee things, but not to pass up an opportunity, we broke them open and scooped out the delicate roe. We enjoyed the delicate but creamy contents and can understand why they are such a prized delicacy. 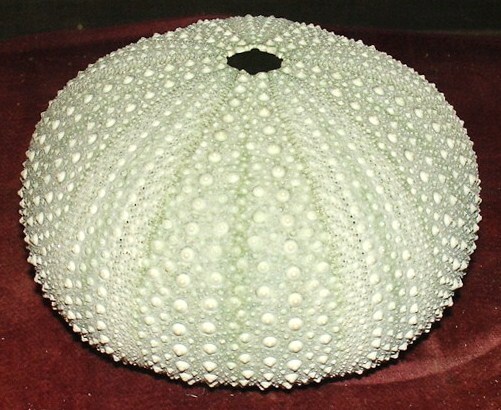 Once the spikey spines have been removed and the shell dried off what remains is this beautiful pale green shell. 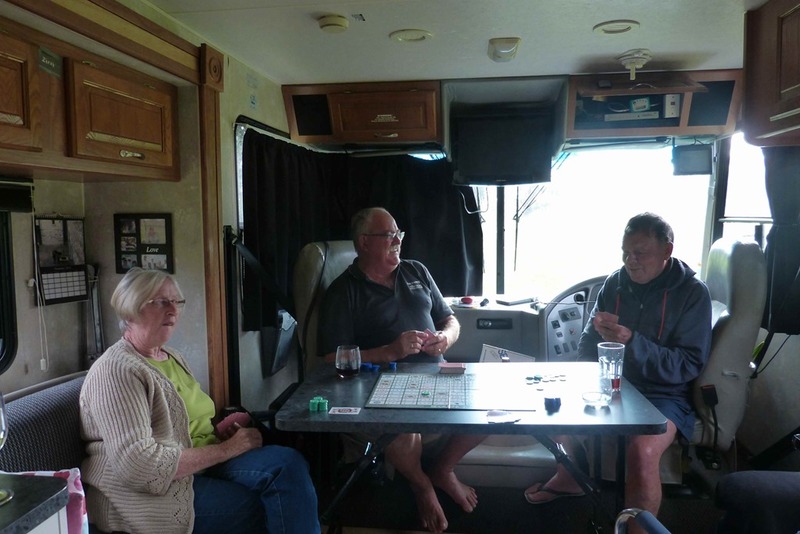 Earlier in the week, friends Bill & Estelle came to stay for a couple of nights in their newly acquired campervan. 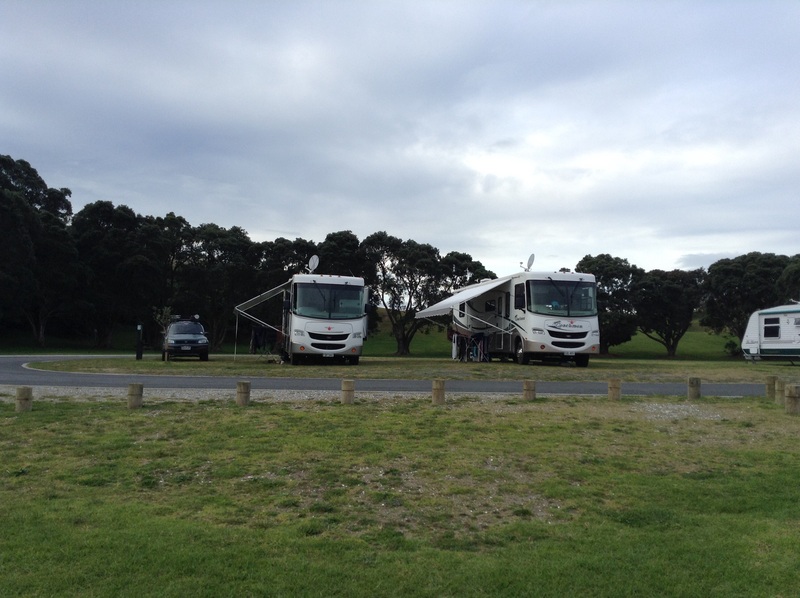 This was to test out all the workings of their new van, and to make sure everything worked as it should. Of course not everything went to plan for them, but at least we could assist where we could and of course we could laugh along with them…..but lets just say what goes on camp, stays in camp!! 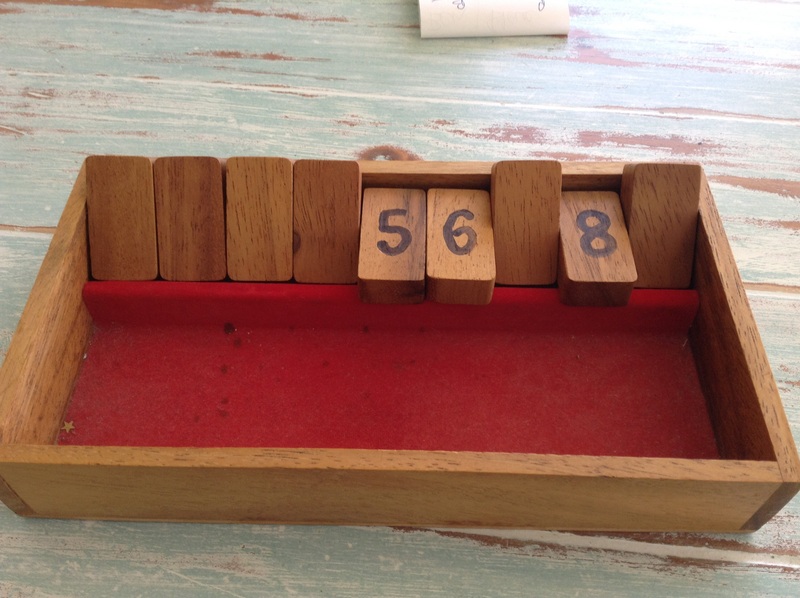 Here we are spending an evening playing Sequence – we let the visitors win the odd game! 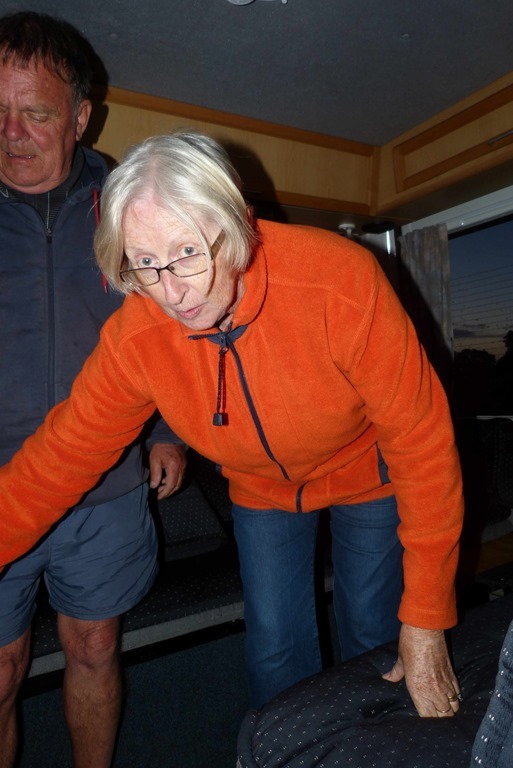 An action shot of Estelle, caught through the window of their campervan, attempting to make up their bed! We did venture out one day by visiting Gulf Harbour which is a development not far from here, which includes housing, golf courses and a large marina. It was interesting to see how the other half live, not our cup of tea though. 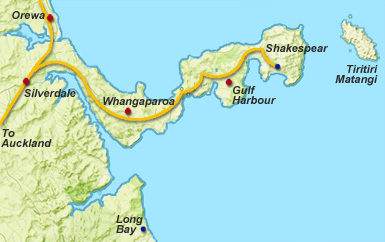 However, there is a ferry that runs from here through to Auckland city and another ferry that goes out to Tiritiri Matangi Island which we shall take at a later date when the weather decides to settle. Unfortunately, the weather was not particularly kind to us whilst Bill & Estelle were visiting. 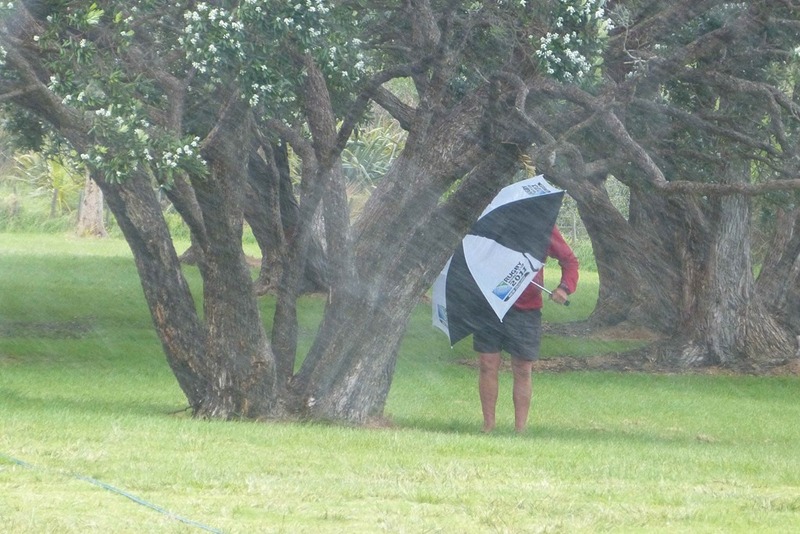 One morning whilst filling up the van with fresh water, Roy got caught in a hail storm and took to shelter under a tree whilst trying to protect himself from the hail with the umbrella. 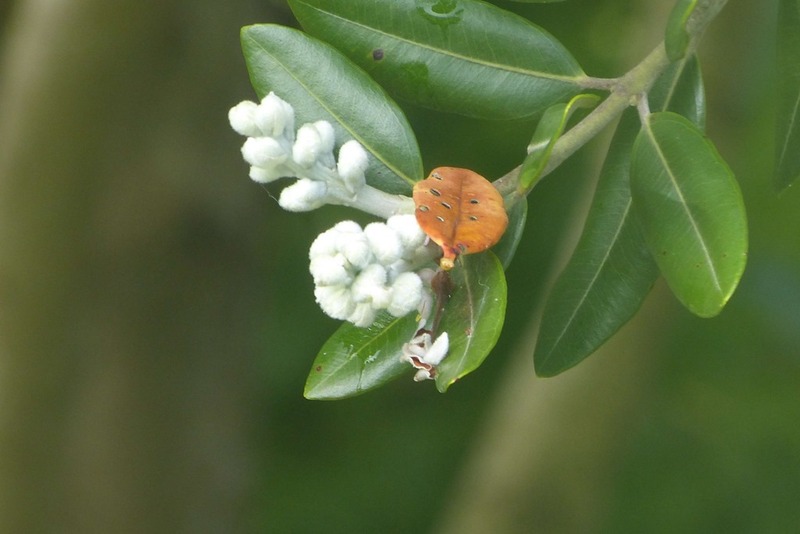 Now you did not think that we would have a blog entry without the obligatory pictures of flora and fauna, did you? 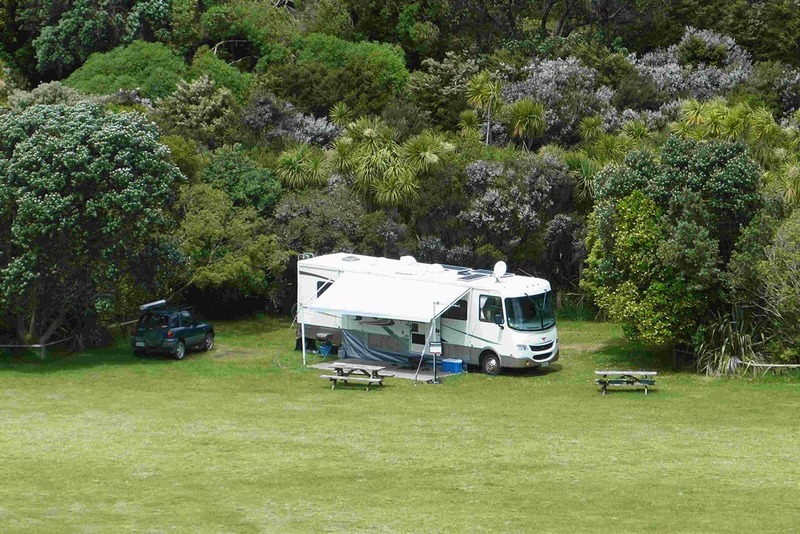 The park which surrounds the camping ground is an Open Sanctuary. 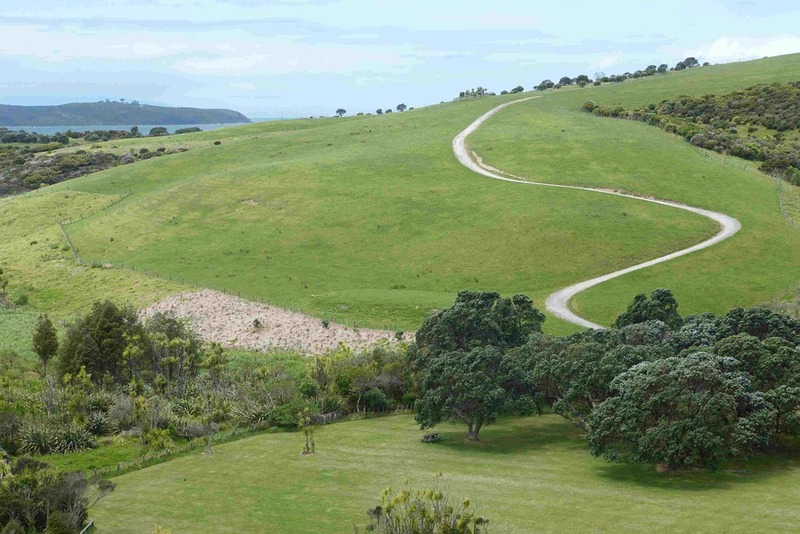 It has a predator proof fence isolating the tip of the peninsular from the rest of it. This area has been cleared of all introduced predators except for a few remaining mice. 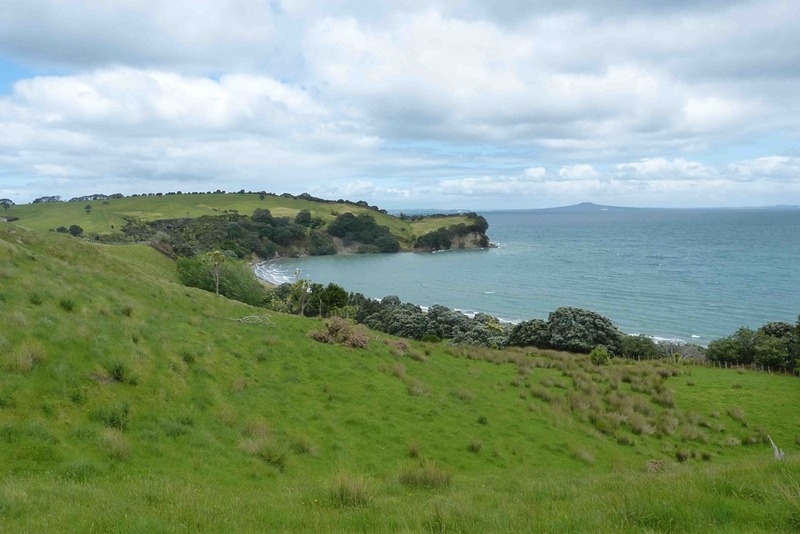 This has resulted in a proliferation of native birds assisted by those that fly over from the Sanctuary on Tiritiri Matangi Island which is another Sanctuary where a number of rare species have been re-introduced. 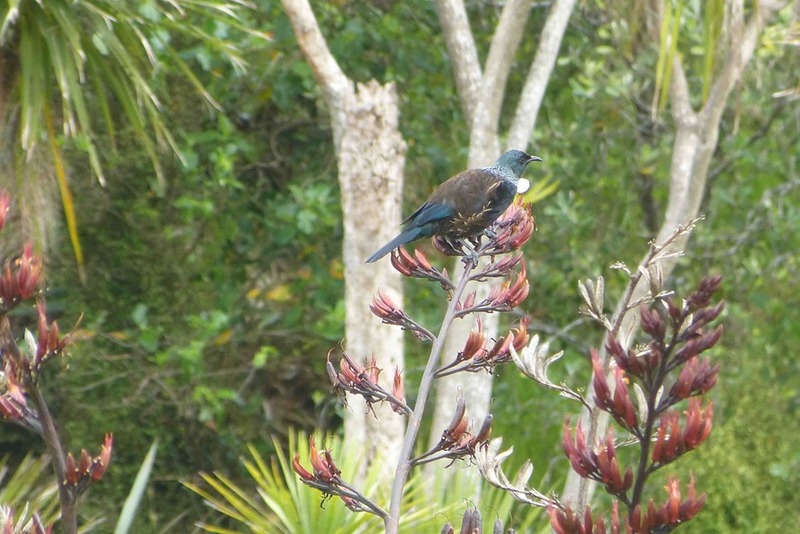 A prime example of a Tui. 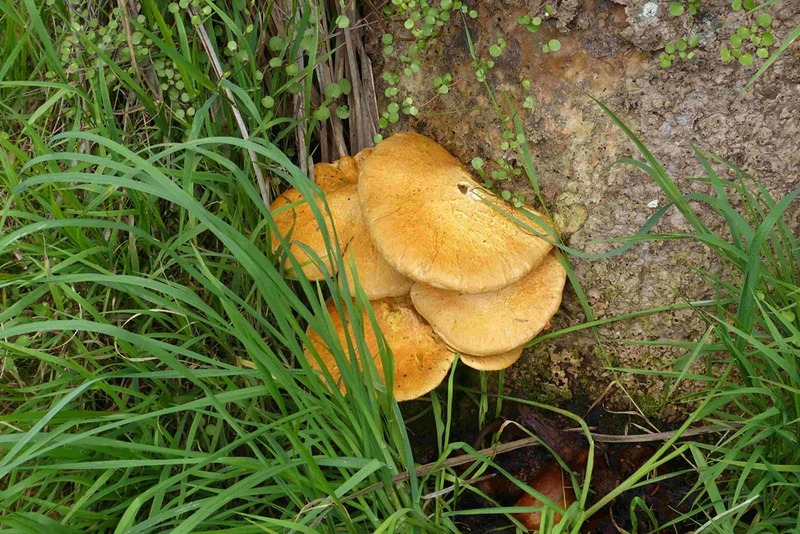 These are very prolific in the bushes surrounding the camp. Their only downside is that they start their day at between 3am and 4am which is little early for a dawn chorus. 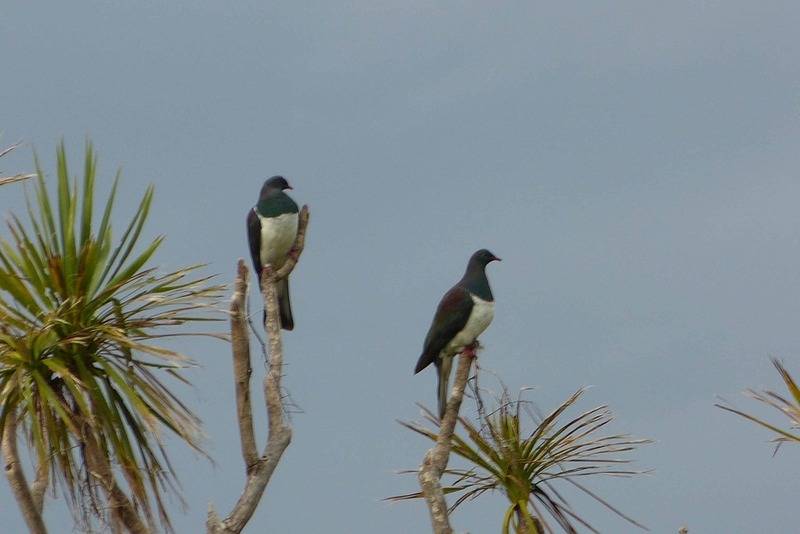 These two Native Pigeons or Kereru arrive late most afternoons and perch at the top of the dying branches of a Cabbage or Ti tree. 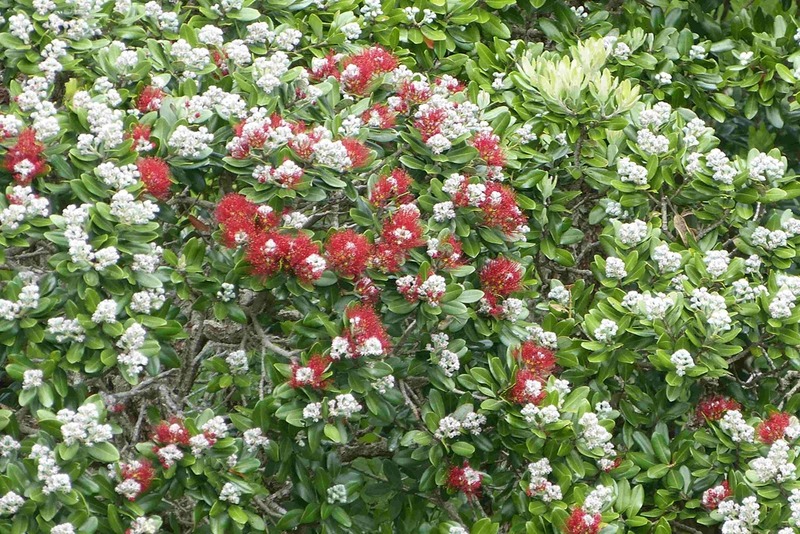 I am watching this small branch on a Pohutukawa tree beside our home and hope to see it flower before we leave. Some are already starting to bloom but they are few and far between at present.